Sign up to Dry July Australia 2018 and raise funds for Chris O'Brien Lifehouse. Chris O’Brien Lifehouse is more than a hospital; it’s a place of hope, possibility, healing and life. Our achievements are possible thanks to our generous, compassionate and committed community of supporters. Funds raised through Dry July will help Chris O’Brien Lifehouse continue to provide truly integrated holistic treatment and cancer care to our patients. Chris O'Brien Lifehouse used Dry July funding towards a Lymphoedema Management Program in the Living Room. This is a coordinated 6-12 week individual treatment program. Treatments may include Lymphoedema drainage massage, laser therapy, exercise and acupuncture services for patients with Lymphoedema, a condition which reduces quality of life. “We are so thankful to Dry July for providing funding for the LivingRoom Lymphoedema service. This funding has allowed us to offer essential services to those patients in need”. However, in February 2016, Angie became ill overnight and a CT scan revealed her cancer had returned and was on her brain. Angie says: “It was like the whole floor was opening up and swallowing me.” She still maintained her positive mindset, however, and vowed that cancer was not taking over her life. Three days after diagnosis she saw her neurosurgeon and a week later underwent two major brain operations to remove her tumours. Angie visits Lifehouse every three weeks for treatment. Before being diagnosed she dabbled in various art projects to release her creative flair. She would often see Deb the Director of Arterie holding group workshops, running around with “Carterie” – small cart trolleys containing a range of quick and easy projects - and engaging with patients. Although Angie was a keen artist, she had lost her sense of creativity and passion whilst going through treatment, until one day she was having a particularly rough day and felt very unsettled in Lifehouse. Deb was quick to notice that she wasn’t seeming herself and encouraged her to attend a watercolour group workshop given by artist Margaret McKenna. 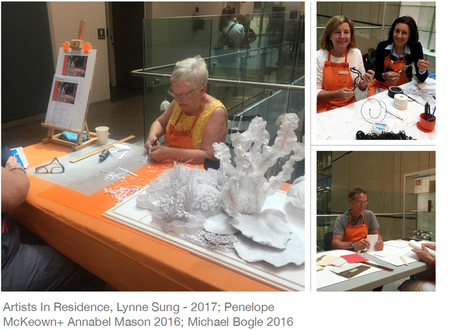 Not only did she enjoy the art but the volunteer running the workshop was a listening ear and provided a perfect distraction to her rough day. Angie says that day will remain among her fondest memories, as she left Lifehouse feeling uplifted and said to herself as she walked home “hey, I’ve still got my creative flair”. She has since participated in other various group workshops creating pieces of art for the hospital, and every time she walks into Lifehouse and sees those artworks hanging she thinks: “Yep, that’s a little piece of me in there”. Angie says Deb and her Arterie team are not only an arts program, they create a sense of belonging, they are inclusive and non-judgemental. 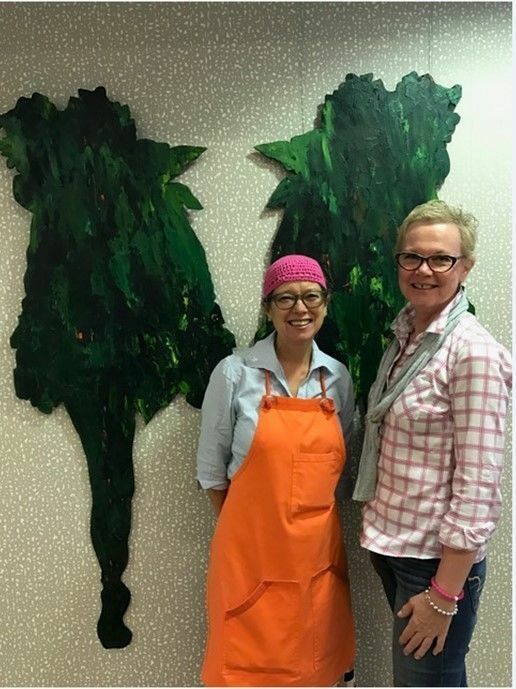 Without the funding Lifehouse receives from Dry July we would never be able to continue to run these patient centred workshops, provide mobile arts studios (Carterie) or create the collaboration artworks to display in the hospital. So Thank YOU! 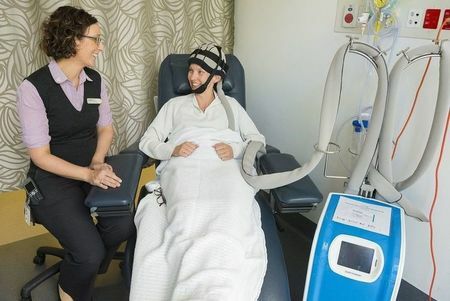 An integral part of the Chris O’Brien Lifehouse complementary therapy program, Arterie supports a holistic approach to cancer patient care through an innovative participatory arts program. Arterie’s mission is to improve outcomes for patients, families, carers, staff and visitors by easing the side effects of cancer and its treatment as well as providing a therapeutic distraction from treatment through art engagement and participation. • AIR sit in the foyer of Lifehouse - its a high public and traffic area - with a performative nature of the art process. Most artists work slower than they imagine end work in their own time on the project that in most instances is gifted to the hospital.